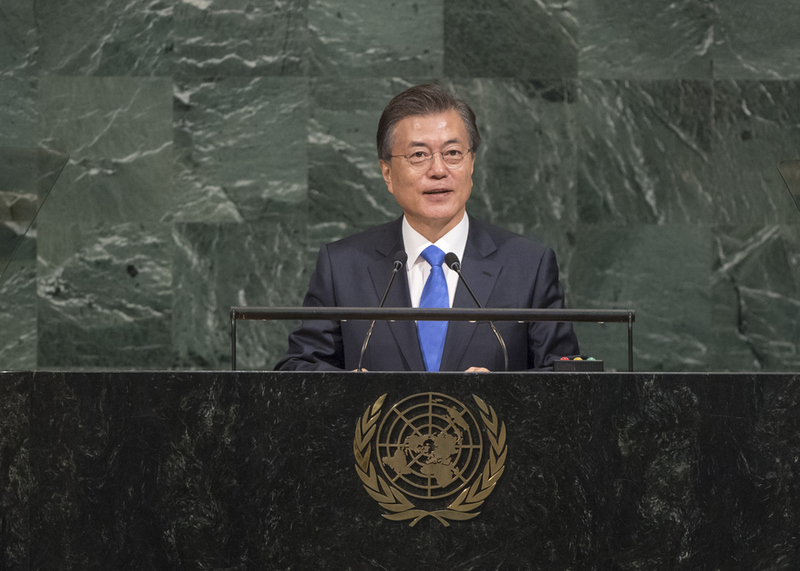 MOON JAE-IN, President of the Republic of Korea, said that, while his country was “belatedly a democracy”, it had shown the world a “new hope for democracy”. Building on that strength, it intended to play an active role in addressing international issues. In the last five years, it had increased financial assistance for refugees 15‑fold, accelerated implementation of the Paris Agreement and met the goal of filling 30 per cent of its Cabinet with female ministers. Indeed, his new Administration had placed people at the centre of all its policies. Explaining that he was from a refugee town, born during the Korean War into one of the “separated families”, whose human rights had been violated, he said the war persisted today in the form of an uneasy ceasefire on the Peninsula. Thus, as the President of the “only divided country”, peace was a calling and a historical duty. “I believe peace, when chosen willingly, becomes sound and sustainable,” he said. Yet, to his country’s great indignation, Pyongyang had carried out its sixth nuclear test, and in its wake, the Seoul Government had worked to convince countries in the region — and beyond — of the need for stronger sanctions on North Korea, to pressure it into halting its provocations and choosing the path of dialogue. The Security Council’s unanimous adoption of the latest sanctions resolution, with “unprecedented” speed, reflected the international outrage. “We do not desire the collapse of North Korea,” he declared. “We will not seek unification by absorption or artificial means”. If Pyongyang made the decision to “stand on the right side of history”, his Government was ready to assist with the international community. He urged “North Korea” to abandon its hostile policies and its nuclear weapons programme in a verifiable and irreversible manner. The international community must sternly respond until “North Korea” did so, with all nations thoroughly implementing the Council resolutions and seeking new measures should provocations persist. The situation must be managed in a stable manner to ensure tensions did not intensify or accidental military clashes did not destroy peace. He said the basic spirit of a security community, enshrined in the United Nations Charter, should be fulfilled on the Korean Peninsula and in North‑East Asia. Having announced a new economic map for the Peninsula and vision for the “northern economy”, he said genuine peace and prosperity would begin when the foundation for a Northeast Asian economic community was solidified, on one side, and multilateral security cooperation materialized, on the other. The Olympic Winter Games would be held in Pyeongchang, Republic of Korea, in 2018, followed by Tokyo in 2020 and Beijing in 2022. He expressed hope that they would become an opportunity for promoting peace and economic cooperation. He looked forward to welcoming athletes from the Democratic People’s Republic of Korea in Pyeongchang, cheered by a joint South-North Korean squad. “It’s not an impossible dream,” he said.